Paddy was not feeling so tip top at his baptism and there was never a good chance to take pictures of him in his pretty little Christening get up. 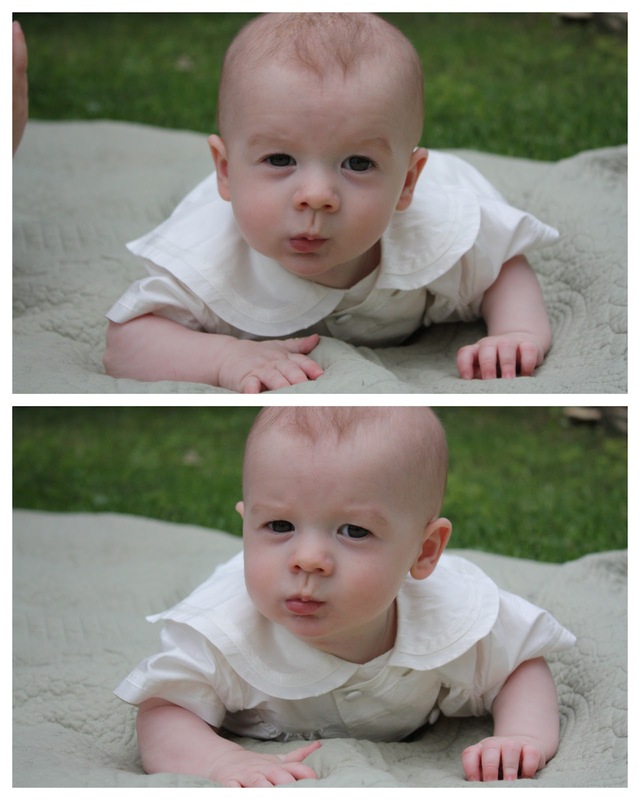 So I decided to dress him up the other day and attempt to take some sweet pictures. So here here they are. Let's just call this "Get off my lawn! ", installment 2. Claudia wanted to put her "gown" on too and join in. They are watching Dora the Explora over my shoulder. Hence the blank stares. Does Dora depress your children as much as it does mine? Or as much as it does me? No mas, Dora. No mas. These two would be tv junkies if I let them. Sweet moment. Sweet babies. Love, love, love them. His expressions are hilarious! Love that last pic - one to frame for sure! I'm lol ing at top 2 pics. Does Dora ever speak in anything other than a full-out yell? Nope.